Light Kali is one of the most well rounded monsters in the game as she can fulfil both a top tier sub role and an amazing leader role. 36x damage is still significant and should be enough damage to clear nearly all the content available. In addition, she has one of the best active skills and excels when compared to other high end leads who usually have lackluster actives. ‘s playstyle revolves around two prong attacks along with matching red, blue, yellow, and purple orbs. Triggering 6+ matches grants the full 36x damage and should therefore plan your moves carefully. The full board change active lowers the chance of orb troll (although you can be given a board with only 3 light orbs) which is the leading cause of death for rainbow teams. All of her awakenings are relevant and synergetic to her playstyle and the only real fault to be found is that 36x is somewhat considered “low” with the advent of awoken cards and MP Dragons. So amazing that I made 2 hypermaxes! 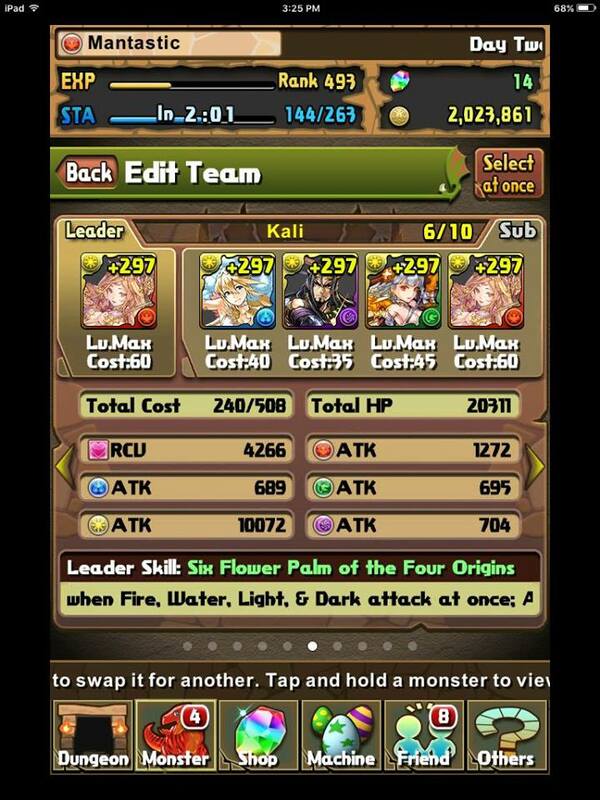 Light Valkyrie is one of my favourite (and farmable subs) because of her quick orb change and offensive awakenings. The single and 2 light orb enhance awakenings contribute significant damage and allows your team to burst higher. Furthermore, the new enhanced heal orb increases your healing or can be converted to enhanced light orbs for even more damage. Lastly, has well rounded and high base stats. The only drawbacks are a lack of and the green sub colour going to slight waste. Chibi Valkyrie has the same active as her larger and prettier counterpart. The chibi form does pull ahead due to her triple , , and awakenings but, is very hard to obtain due to being a rare pull from a rare and exclusive REM. If you are fortunate enough to pull her, she should be heavily invested in as she will be most likely your hardest hitting sub. Fuma is another 5-turn orb changer who converts green to light orbs. This has amazing synergy with ‘s board change as you turn the dead green orbs into your desired light orbs. When compared to , he has less offensive awakenings along with lower base stats, but a very heavy emphasis on health which is a weaker point for . The main attraction for using over is not removing heart orbs because there will be situations where you need to deal lethal damage and heal on the same turn. Sadly, he is also lacking a awakening and you need to find at least 3 elsewhere to achieve 100% skill lock resistance. The light rider, King Arthur is a powerful sub because of the synergetic awakenings, dark sub colour coverage, and high damage output. The active creates a net affect of hearts to light on a longer cooldown than . However, it can be used to generate missing dark orbs if used properly. The 2 awakenings provide large burst potential to compliment the TPA playstyle. I always wanted for the dark coverage when I first began using because he was at the time the only light primary / dark sub colour monster. The main drawbacks of using him are low base stats, a lack of , and a difficult to skill up active. The dark rider has all the same benefits as his light cousin , except he is dark based and his active generates a net effect of heart to dark orbs. Rei Sirius has a unique active in that he transforms the entire left column into light orbs which will guarantee a TPA match. However, you must exercise caution when using the active as you can remove your needed orbs for leader skill activation. It is good to note you can combo with to generate more damage. With 2 and awakenings, he does provide nice burst damage along with some utility. Main drawbacks are low base stats, an annoying active to skill up, and only 3 awakenings. Perhaps I am scraping the bottom of the barrel too hard by including Defoud, but he does have a light generating active (along with removing jammers). The main attraction and why I included him is the dark sub type along with the countless enhanced orbs awakenings adding passive damage. His stats are very skewed towards health and this may prove useful on weaker teams. The main drawbacks are a lack of and awakenings along with being challenging to skill up as his base cooldown is too long to be viable. Ariel will become an interesting sub for once she gains her new ultimate evolution and brings her to a total of 3 awakenings. Being bind immune does not provide too much benefit as she can neither clear binds nor bait out specific colours as she is light / red like . ‘s active can be disastrous to use as it has the chance to remove your required colours so use with caution. Furthermore, she is missing a and may cause constraints on team building. Awoken Anubis does have a viable orb changer and provides along with 2 time extend awakenings. Being unbindable provides the option of baiting out dark binds and granting yourself an extra turn. Lastly, the high and evenly distributed base stats along with 1000 auto heal per turn provides great survivability. Only drawbacks are no light damage and his active is slow to recharge and has less value. However, you can use the counterattack mechanic to help bypass certain perseverance bosses as they will kill themselves upon striking you (provided it does not kill you too). Hermes does have a viable double orb changer, but sadly to the wrong colour. As such, most of his power goes to waste, but his double and awakenings add some utility. However, he does cover your 2 missing colours and is worth at least mentioning even if unideal. Damage enhancing (either type or orb enhance): These subs augment your already formidable damage output and are able to be stacked on top of orb changers to ensure you can burst through the tankiest of bosses. With the advent of stronger and more resilient bosses, the dependency on bringing damage enhancing subs is at an all time high. I always bring at least one on my team because the meta of the game is shifting more towards explosive damage and clearing the floor in one turn as it may become too difficult to stall through giant hits. Awoken Yomi provides a full board enhance along with adding 5 seconds to orb movement time. The bonus time ensures you maximize your matching potential and is best combined with a light orb changer to ensure multiple combos. The high base stats with an emphasis of health provide needed bulk along with providing a awakening. Furthermore, the walloping 3 awakenings provide an amazing 1.5s of additional time. Sadly, the green subtype and dark primary colour contribute little to overall damage output, but overall, a great enhancing sub choice. Sun Quan is another powerful sub that can fulfil the role of a delay and damage enhance. Usually when a monster tries to double dip with their active, it results in a higher base cooldown and a combination of two weak abilities. Thankfully, ‘s active is powerful for both the delay and healer type enhance. Even if only himself and your 2 leaders benefit from the damage, it should still be enough to kill a boss. In addition, the damage buff lasts for 2 turns and can carry over to a second floor should you sweep the non-final boss floor. The delay can be used to safely bypass bosses with perseverance or when you need restall for actives. Unfortunately, does not have a awakening and most of his other awakenings do not benefit a light heavy team. The new ultimate evolution of Izanagi allows is one of the few light primary / dark sub type monsters available. He provides 1 awakening along with a powerful active that enhances all god type monsters by 2x for 1 turn. Comparing his active to other enhancers, it may seem less flashy, but being only on an 8-turn cooldown can allow for it to be used more than once in a descend. In addition, he has 2 awakenings and high base attack makes him hit harder than . He is one of my favourite subs to bring and made him one of my hypermaxes as he will stay a staple sub in the future. Overall, provides great burst potential along with consistent damage output on every other floor while covering the dark attribute. Kanna is a powerful and rare GFE monster who is very similar to as they both enhance god type monsters by 2x ( also enhances dragon type monsters). ‘s active can be max skilled to a 10-turn cooldown and has the added benefit of 1 turn haste. This may seem more appealing, but I feel it lowers the overall utility as the longer cooldown can be problematic as the haste is not going to be abused as you are either using her on the last floor and your team most likely does not run other haste actives. Haste becomes most powerful with additional haste actives and will go to somewhat waste on a team. However, has an incredible 3 , 2 , and a making her one of the best awakening subs possible. The sheer damage you can reach with every TPA match is mindboggling and her only drawback would be no additional colour coverage. Awoken Venus is another powerful damage enhancing sub who covers the blue sub colour along with contributing light damage. The synergetic colour and awakenings combined with 1000 auto heal make her an outstanding sub. It can be challenging to cover your blue attribute along with maintaining high damage output and does both. One wonderful aspect of her active is the low cooldown that lines up perfectly with and 5-turn orb change. As such, you can convert your dead orbs to light and enhance them all along with having 6 seconds of free movement. In addition, you can also use ‘s active with ‘s full board change to help augment your damage. Only major drawback is a lack of and may force you to alter your team roster to reach 100% resistance. Athena is a powerhouse sub who brings one of the highest base attack values in the game along with a light orb enhance. Combining the incredibly high attack value with 2 awakenings results in amazingly high damage that can easily pierce through the highest defence monsters. In addition to being farmable, provides a unique 2 blind resist awakenings that contribute 40% resistance to board blinding attacks. The major downsides to using as a sub are a lack of , 0 base recovery, green subtype, and an active that is somewhat slower to recharge as it enhances both light and (somewhat worthless) green orbs. Durga was at one point a favourite sub of mine as she covered the two missing colours along with providing a 2x burst to god and devil types. I was very very tempted to hypermax her, but decided to hold off in case something better came along. My main concerns with heavily investing in was the lack of awakenings due to the evolution buffing the leader skill (not very helpful as it makes stalling next to impossible) and not awakenings. Thus she lost value as a sub. does provide useful (albeit only 4) awakenings and still can be utilized on your to great success, but be careful when resetting your health to 1. 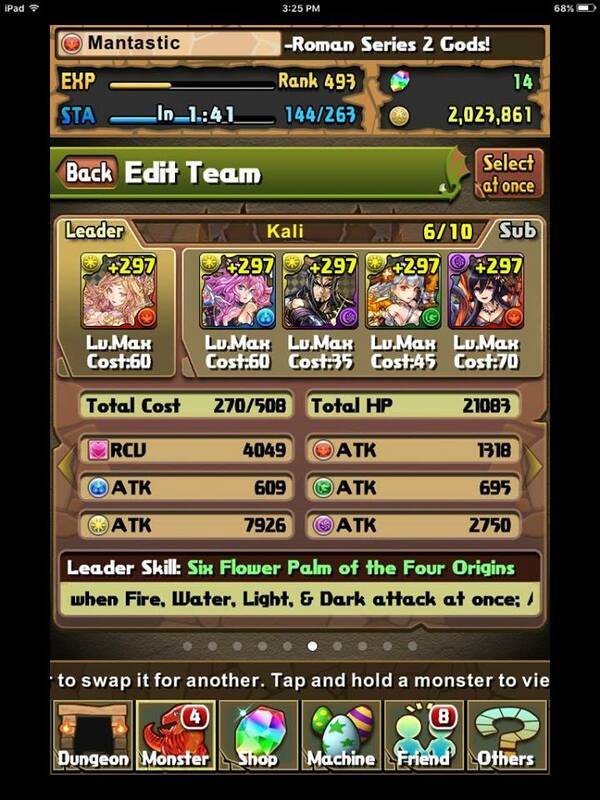 When I first pulled Muse, I was slightly unaMUSEd. Puns aside, provides 2.5x damage for god type monsters but suffers from low base stats and only 3 awakenings. However, he can provide the needed damage to burst down a boss. Unfortunately, he does not provide much more than a single turn of power so you may need to find another sub to fulfil this role. Arcline shares the same weaknesses as , but instead boosts healer type damage and also covers the blue attribute. The single and awakenings do provide some damage and is not as dead weight as . Full board changers: With already providing a full board change, the need to bring a 3rd one (as you have 2 from the leaders) is much lower compared to other rainbow teams. That said, it is never a bad idea to have extra as being able to proc your leader skill is incredibly important and having more access to an ideal board raises your chances of success. 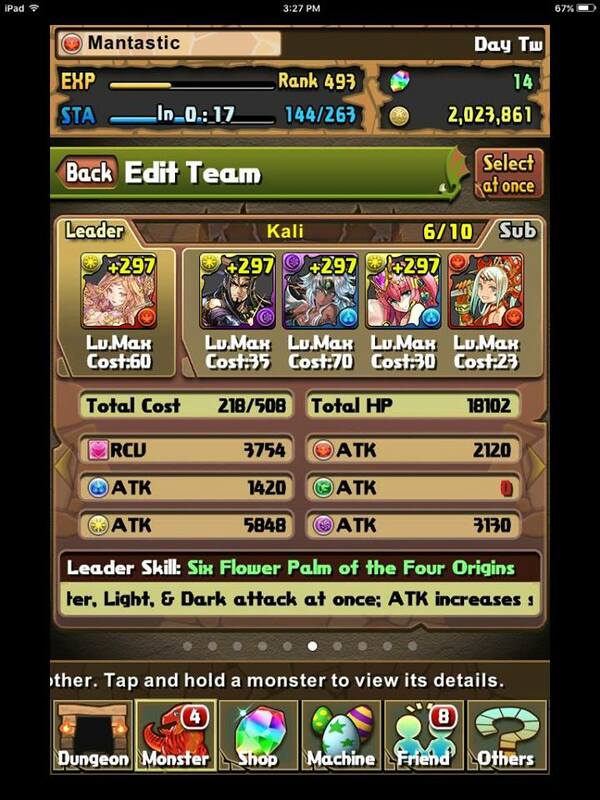 Naturally, Light Kali is an ideal sub for herself as she has synergetic awakenings and ideal colour typing. I tell my friends who are fortunate enough to pull a 2nd one to use as a sub because it is hard to top her power and utility. Only potential drawback would be too many board changers (but rarely happens) and cannot stack actives. On the otherhand, Dark Kali fulfils different gaps in your team roster as she has different awakenings and dark typing. The high base stats along with unbindability, , 2 , and awakenings bring more utility to your team. Being unbindable allows to bait out dark binds and passively clear binds from your other monsters. Her active also generates heart orbs and can be used as a way to heal and deal damage. However, you are more likely to only spawn 3 light orbs, but this can be corrected with other offensive actives. It is hard to find fault in either of the Kalis as they both provide an amazing amount of power and utility. Chocobo is an overstuffed chicken can be used as a “farmable” board refresh that is essentially the same as but with a longer cooldown and a 1000 HP heal. He is given out for free during the Final Fantasty Collab and may not be available again until its return so I hope you managed to pick one up. is a viable sub; however, the need for a 3rd board refresh may be too situational as he lacks a and awakening along with not fulfilling the blue or dark typing. ‘s shining quality is his active, but becomes less valuable on a team as he contributes very little damage and only has a large (albeit handy) health pool. Bind clearing: When deciding if you should bring a bind clearing sub, you must determine how dangerous the binds are. If the bind is preemptive and impossible to stall through, then of course you must bring bind removal. However, if the bind will only occur at certain health thresholds or specific turns, it may be best try and burst through the floor instead. Generally speaking, bind removal subs do not bring damage to the team and can feel like “dead-weight” if the binds can be avoided. Lastly, if your team has high recovery and the binding floor is not too dangerous, it may be advantageous to stall it out. In addition, all the following subs are bind immune and can be used to bait out specific binds to provide a free turn. Awoken Sakuya is a new member of the bind immune, bind clearing monsters and can be successfully used on a team. The single contributes damage along with covering the blue attribute. The other awakenings add utility and defensive capabilities making an all-around valuable sub. Her active grants 3 turns of bind removal as well as a 20% gravity on a 10-turn cooldown. This double dipping can be useful as you can use the bind removal as a safety net and if you are able to avoid being bound, you can instead use the 20% gravity to deal damage to a powerful boss. Lastly, you should abuse her bind immunity to bait out water binds and gain an extra turn. Awoken Isis provides , , and as beneficial awakenings (along with bind immunity) to your team. ‘s active can be skilled up to a 3-turn cooldown which is simply amazing for a 2-turn bind clear. The 15% damage reduction shield may provide useful, but the ability to use the active every 3 turns that sets her apart. The major downsides of using is the lack of damage potential along with the green sub colour going to waste. It is rare to find a blue / green monster and this niche does go to waste on a team. Light Metatron was once the queen of bind clearing, but (thankfully?) with powercreep, we have other options. As of now, provides a large heal along with 3 turns of bind clear on a 5-turn cooldown. However, aside from one of the highest base recovery in the game, provides little other benefit aside from the 2 awakenings. Her damage output is low and she also lacks a which forces you to alter your team composition. Her blue sub typing may provide some ease in team building, but the overall lack of damage potential still hinders her. I go on more of a rant about my love/hate relationship with HERE. Awoken Ama provides 4 turns of bind clearing along with a substantial heal (based on your team’s maximum health). What sets her apart from is her double and single awakenings. Yes she does take longer to recharge, but you are most likely using the active for one specific floor; it is rare you would need to clear binds on 2 different floors. 2 is quite unique and allows for more sub flexibility when team building. Lastly, the awakening and haste built into the active can provide extra utility. Ame no Uzume is another bind immune, bind clearing sub who also covers the blue sub type. I would rank her as the weakest of the bind clearers listed here as she contributes no offensive capabilities, average awakenings (no ), and a very difficult to skill up active. However, her active is unique as it can allow you to easily stall through high damage due to the recovery boost. Dark Izanami is regarded as an S-rank tier sub and this is partially due to the availability of haste on dark teams. However, she is still amazingly powerful even without haste as she provides 35% damage reduction for 3 turns on a 6-turn cooldown. As such, the shield uptime is amazingly high and 35% reduction combined with her giant health pool should ensure you survive every hit. Low health has historically been a weak point for and easily compensates. Furthermore, her 1,500 HP auto heal passively adds survivability and helps compensate for her own low recovery. In addition, she is farmable and relatively easy to skill up via her descend. I wrote a descend guide for her HERE if you wish to learn some tips and tricks on how to more easily clear. Her only drawbacks are a lack of and offensive awakenings, but she is still overall an amazing sub. Indra is a powerful sub who brings 2 and extend awakenings. Having 2 opens up team building and you only need to find 1 more sub to achieve 100% skill lock resistance. His high base health helps compensate for the slightly lower health pools on teams. ‘s shield grants 75% damage reduction for 3 turns on a 15-turn cooldown. This is slightly overkill as you most likely do not need that much shielding, but with ample skill boosts, you should have him ready for the critical floors. The last thing to keep in mind is he does not have an awoken evolution and has plenty of room to grow. Dark Metatron was one of my staple subs when I first started playing because of the dark and blue colour coverage as well as being heavily invested in a long time ago. has very high base stats along with being unbindable and providing a massive 3 awakenings. As silly as it may sound, having too many awakenings can become redundant as you will have all your actives ready by turn 1 and thus have some awakenings go to waste. only helps for the first turn and afterwards provides no other benefit. Regardless, 35% damage reduction for 1 turn on a 5-turn cooldown is okay. Not as efficient as , but the different awakenings may prove to be useful on the right teams. Currently, does not have a , but will be receiving one in the nearish future. Light Izanami is a weaker form of her dark sister and the only reason I mention her is because of the synergetic light attribute and blue sub typing. is challenging to skill up as she is not a guaranteed drop even on mythical difficulty. Her shield has poor value and only provides 35% damage reduction for 1 turn. However, if in a pinch and need a blue sub and shield, can be a suitable candidate. Awoken Susano has dreamy art and a very well rounded shield. He provides 50% damage reduction for 3 turns along with 1 turn of haste. 50% should be sufficient to survive any preemptive along with many execution abilities. You may only be able to use his active once per descend, but the 3 turns of safety offered should be sufficient. Furthermore, his double , unbindability, green main type (for all attribute dungeons), and awakenings all make a dream boatsub. The unbindablity allows to bait out green binds safely and provide you an extra turn. Granted most of his damage will go to waste if you utilize an orb changer who removes green orbs, but you are most likely going to be matching green orbs while trying to proc your leader skill. His other weakness is a lack of so you will need to find other subs to cover for him. I like Kush and I dislike her at the same time. I like her 75% damage reduction shield, high base stats, , , , and awakenings. What I dislike is the fact she is bindable (but still has a awakening), a lack of offensive awakenings, and the overall value of her shield. She provides 75% reduction for 1 turn. Only 1 turn and takes 8 to recharge. Comparing to and this is very bad value as 75% reduction is somewhat overkill as you will almost never need that much damage mitigation. Also lasting only 1 turn puts added pressure on her usage as you may only be able to use her once per descend. Don’t get me wrong, is very powerful, but she is being outclassed by other shielding cards even with her newest evolution. Like , she has the wrong colour for your team, but you are most likely still going to trigger green orb matches when procing your leader skill. Not the best sub, but still worth mentioning. Oku is a powerful sub for your team as he covers your 2 missing colours along with providing synergetic awakenings and a single turn of delay. You can also abuse the 2 awakenings to burst through high defense light monsters. The combined with purple and blue coverage greatly reduces stress when team building and allows for more flexible sub choices. Depending on the length of the dungeon, the number of on your team, and the cooldown of ‘s active, you may be able to use him twice in one descend. Being on an 8-turn cooldown gives the possibility to use the delay on the first floor because the 2 leaders provide 4 on their own. Sun Quan is a powerful sub as he has an active that can fulfil two roles. Usually when a monster tries to double dip with their active, it results in a higher base cooldown and a combination of two weak abilities. Thankfully, ‘s active is powerful for both the delay and healer type enhance. Even if only himself and your 2 leaders benefit from the damage, it should still be enough to kill a boss. In addition, the damage buff lasts for 2 turns and can carry over to a second floor should you sweep the non-final boss floor. The downsides to using is a wasted green sub colour, no awakening, and somewhat challenging to skill up. Awoken Orochi can be max-skilled to 15 turns and provides an overwhelming 4 turns of delay. This is quite excessive as most things should die within 2 turns but I am sure someone will argue that 4 turns of delay is justifiable. However, as a saving grace, has an unbelievable 4 awakenings which results in amazingly high passive damage with every water two prong activation. This is where you will need to weigh the pros and cons of using an somewhat lackluster active sub who has no awakening and is the wrong colour for teams. He may constrict your sub pool choice, but does provide a substantial blue burst of damage. If given the option (even if max skilled), I do not think I would use on my team as he is slow to charge and somewhat overkill and does not offer much aside from safety on one floor. However, everyone has a different playstyle and expectations so take my own usage with a grain of salt. Gravity: Gravities are starting to come back into style as they can be used to push a boss into specific health percentages and is most useful to either knock them into a favourable colour or to by pass perseverance. Hathor will be receiving her ultimate evolution some time soon and it will grant her a , , and a total of 4 awakening. The ensures 4/5 light orbs will be enhanced and adds significant damage to your team overall. The blue subtype is a nice added bonus as can alleviate stress when team building. The 25% gravity is substantial and at least starts at 18 turns compared to Hera-Is and her 30 turn non skilled base form. However, until receives her ultimate evolution, she may be too difficult to justify using as a sub due to lackluster awakenings. Awoken Sakuya is a new member of the bind immune, bind clearing monsters and can be successfully used on a team. The single contributes some damage along with covering the blue attribute. Her active grants 3 turns of bind removal as well as a 20% gravity on a 10-turn cooldown. This double dipping can be useful as you can use the bind removal as a safety net and if you are able to avoid being bound, you can instead use the 20% gravity to deal damage to a powerful boss. Lastly, you should abuse her bind immunity to bait out blue binds and gain an extra turn. Team building for revolves around fulfilling your colour requirements, addressing the dungeon mechanics, and adjusting your skill lock resistance accordingly. Keeping this in mind, there is no “perfect” team that can clear all the current content and needs to be fluid and dynamic to adjust to new challenges. I am fortunate in using in all her previous forms extensively and this has given me a large pool for highly plused subs as the two teams have many overlapping characters. In an ideal world, you would bring as many light based subs as possible to maximize damage and it is possible to do so, but it may lack utility or . When deciding if you need to bring a bind clearing sub, you need to determine the nature of the binds: is it a preemptive, are you capable of stalling it out, and is it possible to burst through the floor and thus bypass the bind. As a general rule, bind clearing subs lack damage output so it may be advisable to bring a burst oriented sub instead if the bind only occurs at certain health percentages. These are some of the more notable teams I have used successfully and the key is adapting to the dungeon’s demands and mechanics. My notable bias towards is to ensure I have a steady supply of light orbs to two prong attack with. I used to struggle with a dark sub along with covering blue prior to the newer evolutions and is one reason I used so much. With gaining the dark subtype, I was overjoyed and quickly began investing heavily into him as he brings large burst and consistent damage throughout the dungeon. I am quite pleased with my sub pool depth for and I do not have any needs/wants for specific subs as I can cover every kind of threat with what I already have. plays a bit different than most rainbow teams because of her powerful active. This greatly reduces the chances of orb troll and frees up your sub slots for more utility or damage. However, you will still need exercise careful orb management and be able to decide to try and sweep the floor or stall it out for a better board. You should always enter endless corridors to test your damage output (with a two prong match and without) to give yourself a relative idea of how much damage you can deal. This is important because you may need to stall on a floor to acquire 4+ light orbs to trigger your two prong attacks. The reliance on damage is partially why I enjoy using or another offensive light orb maker. In addition, you should determine your base recovery (how much healed when matching 3 heart orbs) as each subsequent combo adds 25% healing. For example, 4000 base recovery will heal 8000 HP when matching those 3 hearts and 4 additional combos (5 in total). 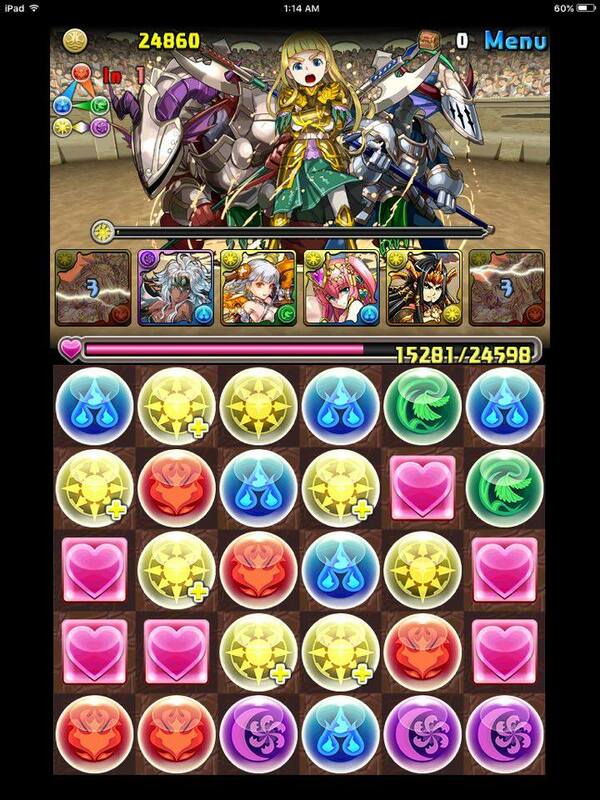 You will need to stall throughout the dungeon and this information helps you determine if an active is needed. Also, try to make a tentative plan and mental note of which floors you want to use actives. This provides some guideline to your usage and helps you plan out your team composition and awakenings accordingly. When determining how much skill lock resist you should try to achieve, you need to determine how dangerous having your skills locked is. Can you stall through the binding floor without actives? If the answer is yes, you may not have to alter your subs if it hinders your performance on other floors. The same can be applied to monster binds: if the bind will not result in your death, feel free to just stall it out instead of gimping your team with a bind clearing sub. Overall, is a fun and exciting leader to use as she will test your combo skills and patience. It may take some getting used to if you are not familiar with rainbow teams, but I am confident you will learn fast once you see the damage output for yourself. Previous PostMantastic PAD 2.5 Months LaterNext PostYomi or Ra Dragon with my first 300k Monster Points? Hey bro what do you think about chibi Valk instead of regular Valk? Don’t forget about Kanna! 3 2-prongs, 2 skill boosts, and 1 skill bind resist is just icing on top. Haste included in the 2x gods & dragon active, which includes certain subs you mentioned like awoken susanoo. I’m still a beginner looking for information about pad.. I.use pad guide and check pads but most of the time I’m left with more questions. I would love to learn how to calculate and understand all the information on each card. PAD Guide has comparison but I’m still uncertain how to follow the information. I’m wondering what your feelings are toward Awoken Bastet. Her awakenings are synergetic (off color green TPA vs. blue pre boss still works). Even though off color, mass attack without tpa allows less orb troll because the whole team is dealing damage without relying on TPA. I use her often, but feel like i’m crazy for doing so. The Mass Attack feature from Bastet is only helpful when facing 3+ bosses (which hasn’t happened yet). You should still be striving to match TPA even on a single enemy as you benefit from +50% damage per awakening. Orb troll should be quite low due to the abundant board refreshes and unless your Bastet is heavily invested, another light orb changer will more than compensate for the damage on even blue bosses. I’ve been using Shinji&Eva to fill the water/dark and for the orb change. Since he isn’t mentioned at all, I wonder if he isn’t as useful as the others? That is an interesting card I never considered! Their active is quite unique and is one of the few double orb changers that can be used on Kali teams. However, it may not have as strong of a place compared to other subs due to not generating light orbs and being water/dark themselves. With double Kalis, you should be safe in the orb change department and would rather prioritize light orb generation as that is the main source of damage. What about Sha Wujing? 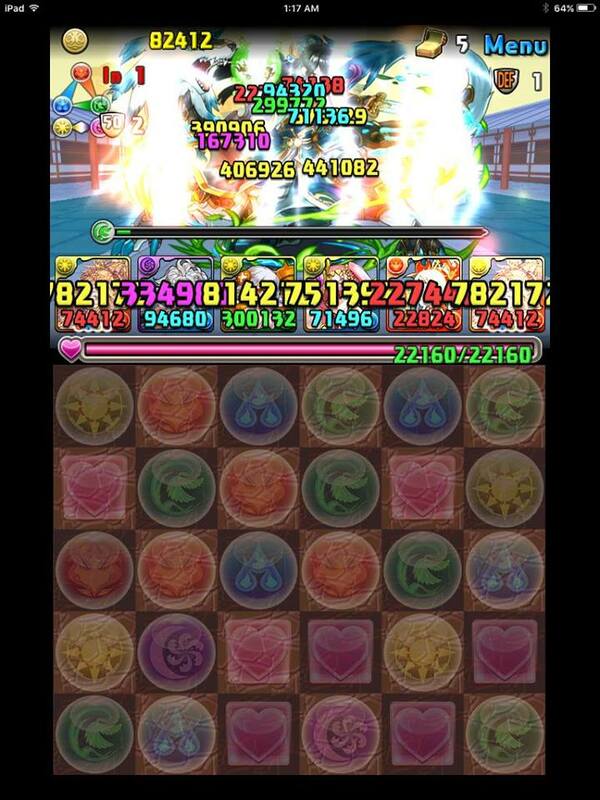 I know he has awful stats and not that great awakenings , but he does have decent orb changing abilities . 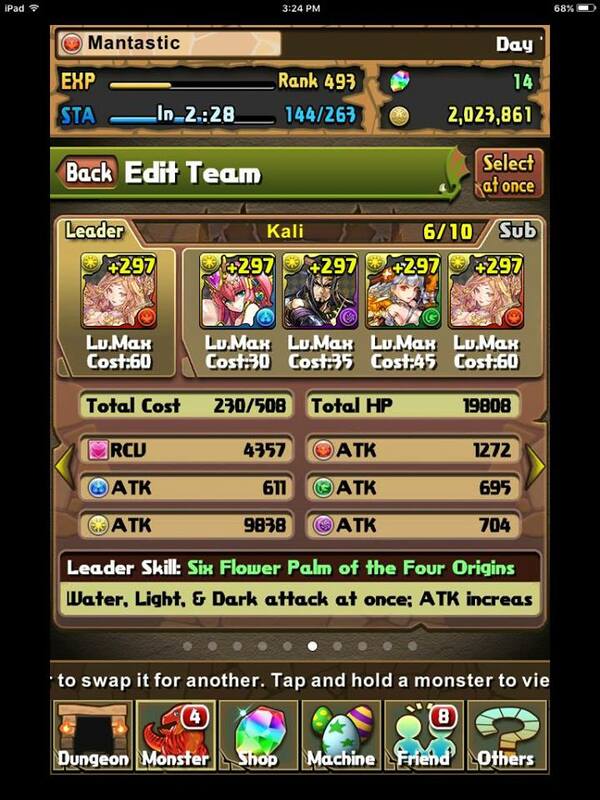 Would he work as a farmable sub, assuming I can’t find any other decent water subs? Thank you! Kali was my first substantial card in this game, but I admit I’m only just figuring her out now. This has been useful. I have a uevo Ganesha as a sub (when all other types are covered). 2 TPA, jammer resist and skill-lock resist seem useful, and the damage void is effectively a one-turn delay (unless the turn is a non-damage attack). Am I missing something, or doesn’t he seem like a decent fit? Otherwise, I’m flip-flopping between Awoken Neptune (for poison, but the attacker/devil buff admittedly doesn’t do much aside from Fuma) and Hathor for water typing. Hathor makes it a more light-focused team, especially when alongside Ganesha. But my dark typing is admittedly lacking, so I’m relying on Divine Queen Hera, which makes Hathor’s gravity skill somewhat redundant. Finally, what of b/l Sun Quan (1740)? 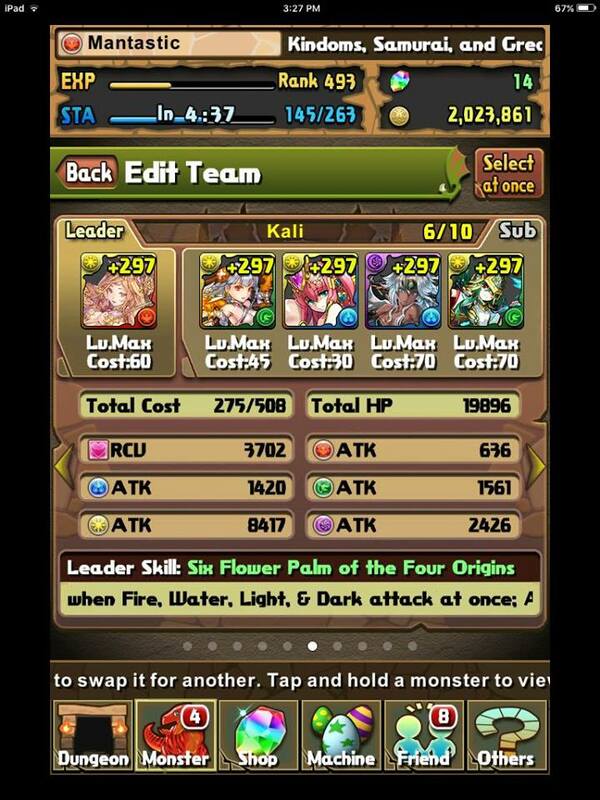 Same delay and healer buff as b/g Sun Quan, but no pesky green typing. Again, when used with Ganesha, the healer buff can be rather useful. Ganesha is a better choice than Neptune; however, he is okay at best due to the high CD and low value from his active. You ideally want to have a light focused team as it provides the most damage overall.